Looking for an affordable, professional quality photo backdrop? We carry a variety of high quality photo backdrops that can be set up quickly, whether you are mounting to a wall or need it to be free standing. Our photo backdrops complement any photo ID card system, and will give your ID badges a more consistent and professional appearance. We keep our most popular backdrops in stock and they are displayed below with Light Blue fabric. However you can also choose Gray, White, Red, Green, Yellow, Royal Blue and more. If you need multiple backdrops we can even help you create a Custom Printed version with your organizational branding, logos, mascot, PMS colors and more. 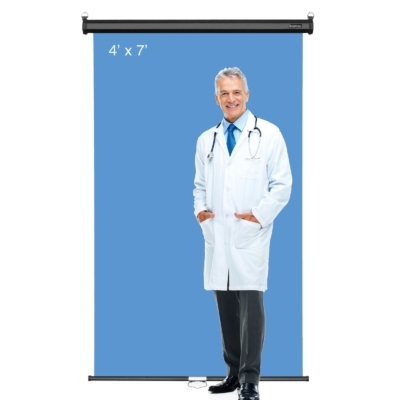 Our backdrop stands are very popular with Health Care facilities, Medical and Dental Centers, Schools and Universities, Government Offices and Corporate entities with Human Resources or Security Departments. You can count on our fast shipping, excellent service and competitive prices when it comes to all your ID badge printing needs with tracking confirmation sent out same day as order!